Is it really the end of May? That means I only have three weeks to get ready for vacation. I had 813 comments on one post. Granted it was a giveaway post but I also gained 99 new followers! I am so excited that so many people like my blog. I really enjoy writing it and enjoy all the people I have met through my little corner of Blog Land. I also won a charm pack and 10 spools of thread on Michelle's blog from Giveaway Day. It's so fun to win! This week I was able to visit my son, daughter-in-law and 4 grandchildren in Arizona. 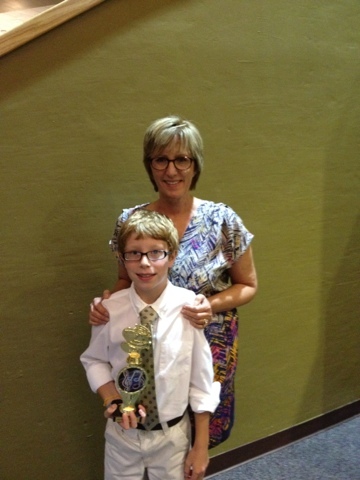 Jack had a piano recital and he did so well. I was so proud of him for having the confidence to get on that stage and play in front of an auditorium full of people. 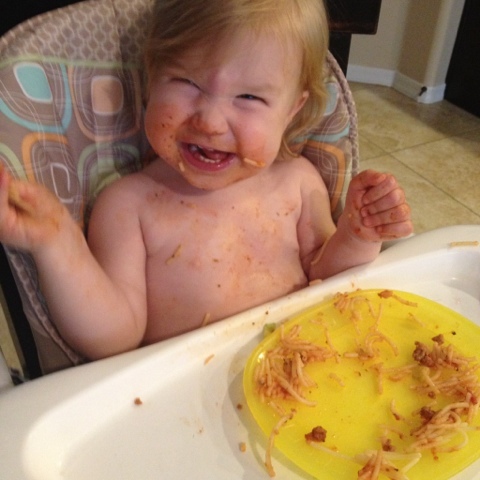 Little Miss Olivia sure did enjoy her spaghetti dinner. 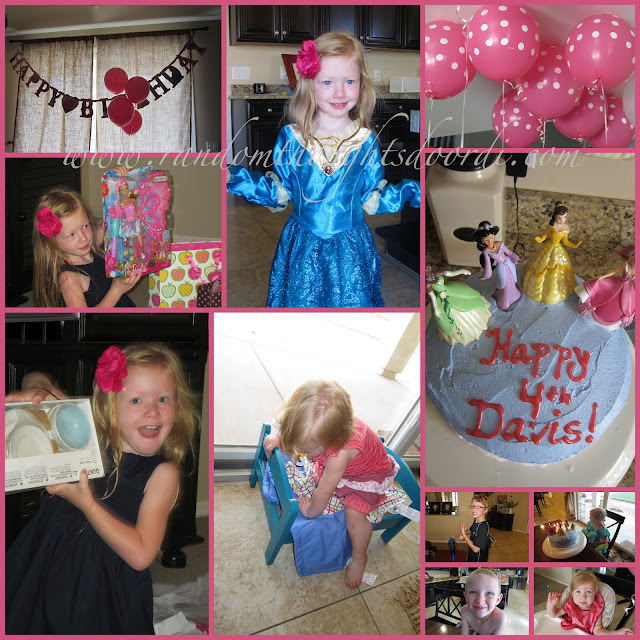 A certain princess celebrated her 4th birthday. 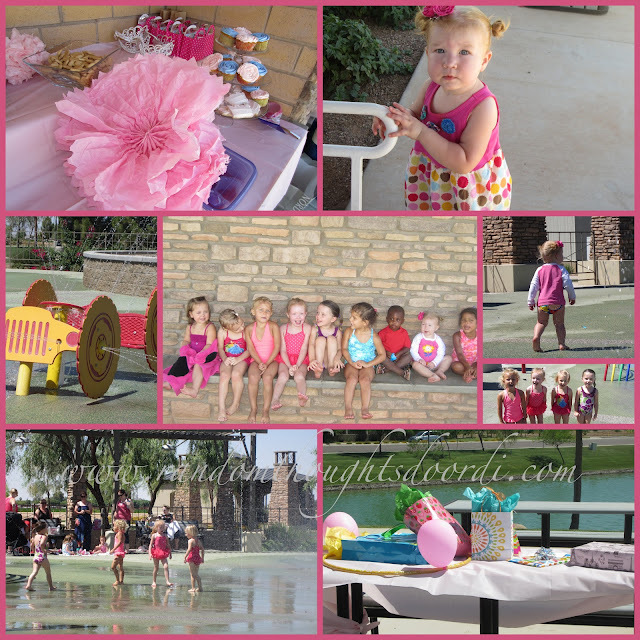 Then at the splash park with her friends. This photo reminds me of something you might see in Martha Stewart Living magazine. 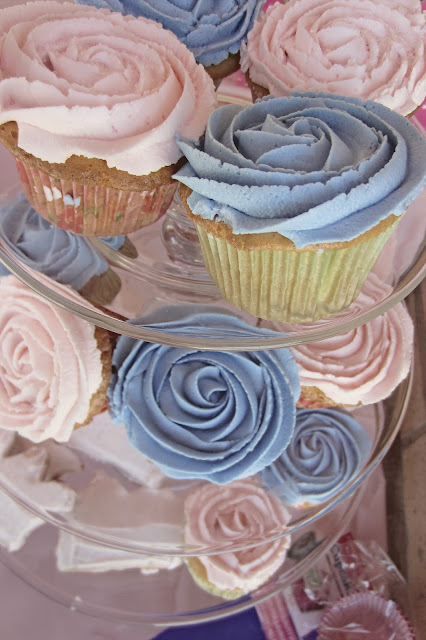 Molly is so talented when it comes to parties, baking and decor. 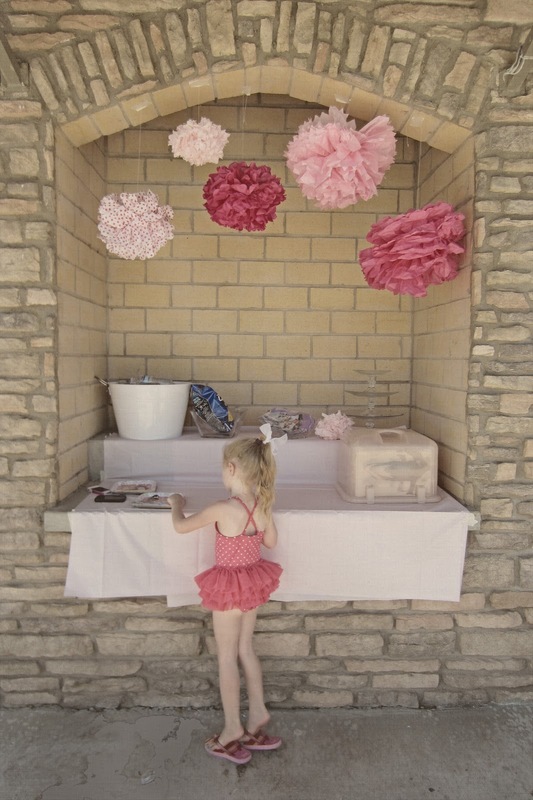 She also made Olivia's sweet little tank top dress in the photo above. Something new for me this week. snaggle tooth and the crowding of my lower teeth. We attended a beautiful wedding with perfect weather in San Diego. Our #4 son's best friend and business partner got married and Kyle was the best man. Kyle met Matt and Pearl the first year at USC dental school. They all became friends and study partners and now, 6 years later, Matt and Pearl got married! There were more dentists at this wedding than at a dental convention (not really, but there were a lot). Mr. Romance was so happy to see a lot of his former students from the charity dental society that he mentors each month. What a great group of fun and caring people! We really liked Kyle's date, Fabrizia, who unfortunately will be moving back to Rome next month. Mr. Romance wore his silly white sun glasses, just for fun. 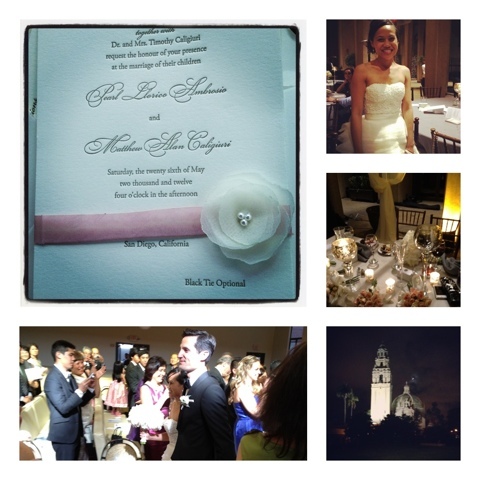 After a lovely church ceremony, the reception was held at the San Diego Museum of Art. 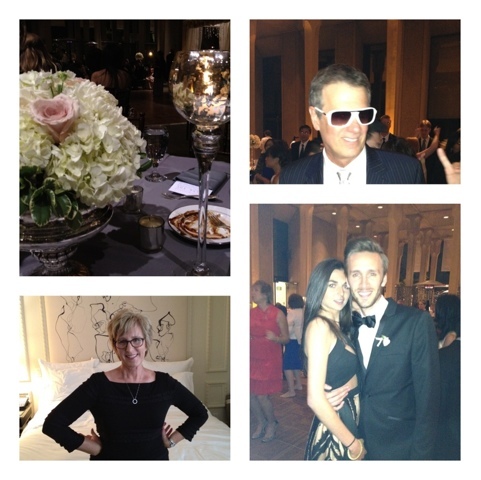 It was a perfect evening of dinner and dancing. Matt and Pearl made their entry into the reception down this beautiful marble staircase lined with candles. 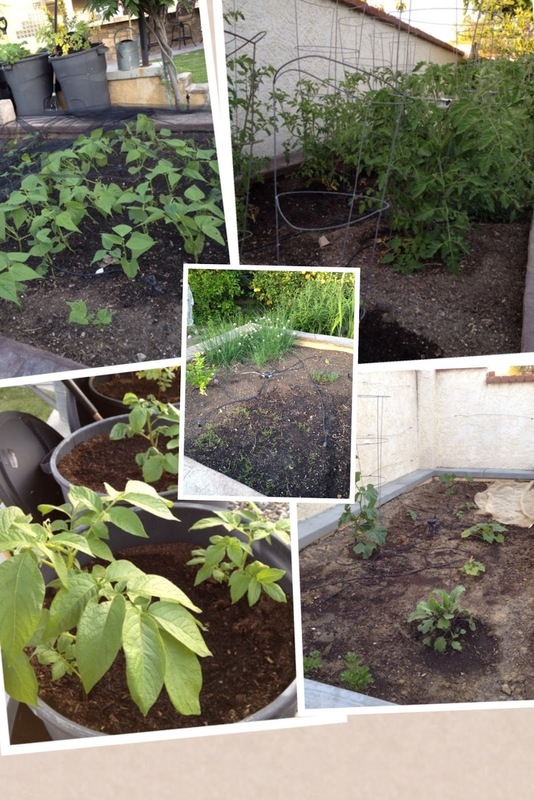 The garden is really doing well, especially the tomatoes. The squash planter is off to a slow start but showing promise with the warm weather we had this week. I planted carrots, radishes and sunflowers this week. I have 2 quilts to baste and bind this week. Wish me luck. It might be pretty silent around here. But don't forget to come back on Wednesday to see what I have made for my stop on Ellison Lane's Summer Sewing Contest Blog Hop. You have been busy, and what a great time! Happy days. Wow, you have been busy! Now I know why I don't blog about things other than sewing - it would be totally boring! 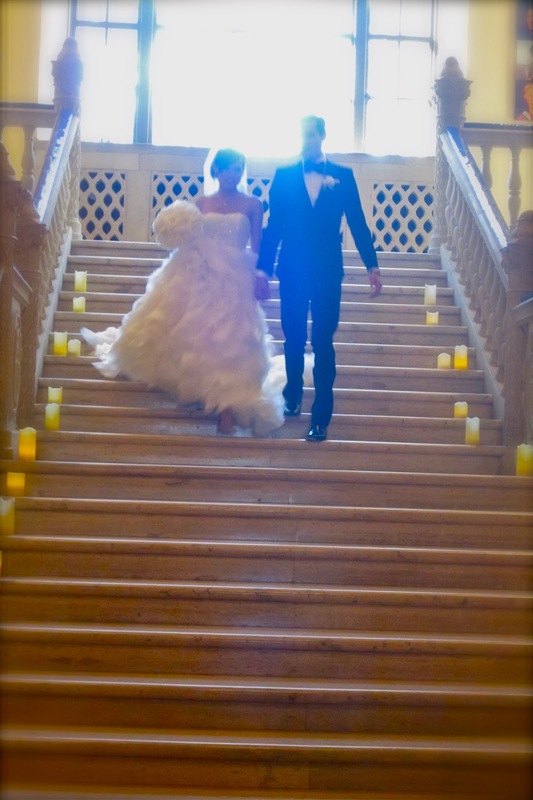 The bride and groom looked beautiful! Cute pics - you'll have to tell me how those braces things work! What a beautiful life you have. I love reading about it and catching glimpses in your photos! I agree with Dana! Have a great Memorial day! 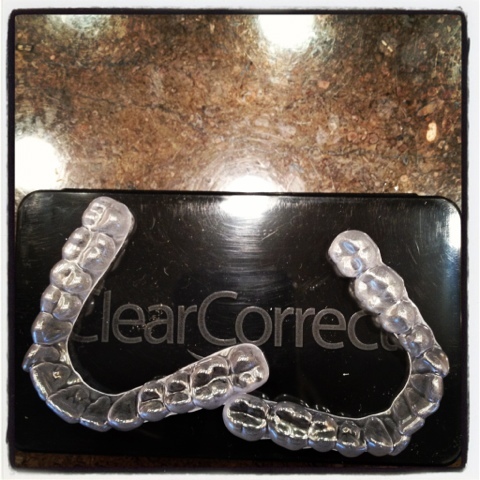 My BF's Mother wore the clear 'braces' and LOVED them! (and her teether were BAD to start with) they worked wonders on her teeth! Good luck!! What a special week for you Di -lovely photos of the family as ever! Such a fun filled week! And that wedding looks gorgeous! Whoa! That was a busy week girl! But how presh are your grandkids? !